I wake up each morning and try to keep these words at the front of my mind. So much has changed in the last year. The anniversary of Ethan's injury, along with the complete alteration in my family's dynamics, looms in the not-too-distant future. How is it possible that nearly a year has gone by? I can vividly recall specific moments spent as a family last May and June. 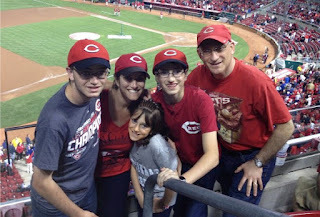 Our last family trip to a Reds' game; sending out homerun photos of Ethan to our families on the west coast; my last photo standing next to Ethan when I dropped him off at camp, wondering, "How did he get so tall?" With today being Mother's Day, I reflect back on all the years I've been a mother –17– and all of the beautiful memories we have created as a family. As I look through the photos of years' past, I don't necessarily long for those days back, yet I remember them fondly as chapters in my life. My first Mother's Day photo with our three children, how our family felt complete. While motherhood hasn't been without its share of challenges, the phrase "the days are long and the years are short" sticks in my head. How has this year changed me? I am not the same person today that I was a year ago. But are any of us? My heart has been deeply altered. The emotions that have pulsed through my veins have kept my body in a constant state of motion. I cycle through the past, present and future and recognize that by reflecting on the past, standing in the present and looking to the future, I can continue to embrace all that is my life. I have cried more tears in the last 10 1/2 months than I thought was humanly possible. I have played a constant loop of the best case scenario and the worst case scenario in regards to Ethan; maybe he'll land somewhere in between. I have seen the enormous human spirit work in miraculous ways. I am surrounded by a beautiful network of people who have virtually linked arms, surrounding my family in love and support, and have let us know that they will not let us fall. I am profoundly affected by the young man in front of me, as well as his older brother and younger sister, for their resilience in the face of tremendous changes. I am grateful to be on this path with a fabulous husband and father who walks alongside me, holding my hand. I will be there for my family, even on days when I don't think it's possible to raise my head off the pillow and put my feet on the floor. I will keep moving in a forward direction; one of my new mottos is "onward and upward." I will keep strong and recognize that baby steps on this path are better than no steps. I will hold you tight, and I won't let go. As mothers, it's what we do for our families. I don't think I have done anything extraordinary that another mother wouldn't do for her own child. 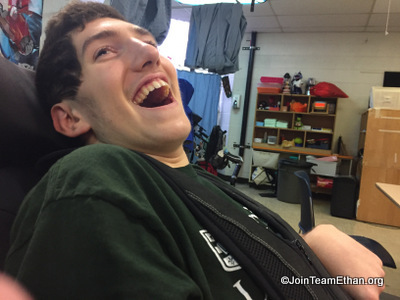 While I don't believe that God targeted Ethan with a lightning bolt on that day last June, I do believe God has played an exceptional part in assuring that my family was supported all these months. Ethan shows small signs of response. These are some of the baby steps we are looking for. I have faith that there will be many more of these baby steps in the future. We will meet him where he is, each step of his journey, and celebrate as a family. Scott and I think about our own mothers today, both in Redondo Beach, California, and in Seattle, Washington, and send our appreciation for their years of unconditional love and for supporting us on this unexpected journey. To all of the mothers who have stood by us and made my family their own, I thank you and wish you a day of blessings, love and strength.